The films are for sale online today. 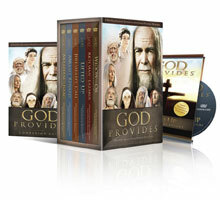 Available individually or as a group, each film comes with a companion guide as well as supplemental teaching on the DVD by Crown CEO, Chuck Bentley. Throughout history, people have wrestled with the concept of trusting God to meet their needs versus relying on the world. Through stirring accounts found in the Bible, God reveals how He wants to be our ultimate Provider. This film learning experience offers a rich, dramatic journey through six theater-quality, epic short films and printed companion guide that can be used for individual or group study.